There is a lot to unpack in this statement by the White House spokeswoman, part of an administration effort to deflect attention on the Trump campaign during the sprawling investigation into Russian meddling in the U.S. election. President Trump has also tweeted an article about the mysterious firm, Fusion GPS, as he decried a “witch hunt” by Democrats. What is Fusion GPS and do Sanders’s claim hold water? This is a complicated tale, making it easy for the White House to try to stir up a little fog. If this were a novel, one might say it was not a credible plot twist — that the same firm that helped inspire a salacious Russian dossier on the incoming president was also working on behalf of Russian-linked interests at the time. But, hey, this is Washington. While there are many lobbying or research firms with a certain ideological orientation, some operate like law firms, doing specific work on behalf of a client who hires it. Fusion GPS was started by a group of former Wall Street Journal reporters, notably investigative reporter Glenn R. Simpson. He co-wrote an article about how lobbyists and other Washington insiders were earning big fees representing former Soviet officials-turned-businessmen. The firm says it “provides premium research, strategic intelligence, and due diligence services to corporations, law firms, and investors worldwide.” In other words, the ex-reporters have leveraged their reporting skills into a profit-making enterprise. Fusion in June hired Christopher Steele, a former MI6 agent known for his contacts in Russia, and Steele produced a series of salacious memos, claiming the Kremlin had the goods to blackmail Trump, which made its way to reporters, members of Congress and the FBI. The FBI considered Steele’s work credible enough that it reached an agreement to pay him to continue his work, though the planned arrangement fell apart after the dossier became public. Meanwhile, Fusion had been hired by Baker Hotstetler in early 2014 to assist on the defense against a civil action filed by the U.S. government alleging fraud by Prevezon Holdings. In 2013, authorities accused Prevezon of receiving proceeds of a scheme to defraud the Russian treasury of $230 million and laundering the ill-gotten funds by buying real estate in Manhattan. Prevezon is owned by Denis Katsyv, the son of a senior Russian government official. Hermitage Capital Management, the alleged victim of the fraud, is headed by William Browder, once a top investor in Russia who had a falling out with the Russian government. Browder had hired Sergei Magnitsky, a Russian tax accountant, to investigate an alleged theft from his Russian companies, but Magnitsky was arrested and died in prison in 2009 under suspicious circumstances. Browder’s advocacy of Magnitsky’s case led Congress to pass the 2012 Magnitsky Act, which bars Russian officials believed to be involved in the lawyer’s death from entering the United States or using its banking system. In response, Russia blocked U.S. parents from adopting Russian children. So, two different clients, two different deals for Fusion. But then the story lines merged. Veselnitskaya was also working for Baker Hotstetler on the Prevezon case, according to a declaration she filed in federal court in 2016. In addition, she sought to help Prevezon fan opposition against the Magnitsky sanctions. Shortly after her meeting at Trump Tower, she attended a House Foreign Affairs Committee hearing on Russian sanctions and a screening at the Newseum of a film attacking the Magnitsky Act. Another person at the Trump Tower meeting was Rinat Akhmetshin, who was once registered as the lead lobbyist for a group called the Human Rights Accountability Global Initiative, which claimed it wanted “to help restart American adoption of Russian children.” It was housed in the same office building as Baker Hostetler. Denis Katsyv, the owner of Prevezon, was listed as one of the Russians who controlled the organization, which no longer seems to exist. Information uncovered by Fusion as part of the litigation also became part of the anti-Magnitsky campaign. In 2016, Browder filed a complaint with the Justice Department accusing Fusion of failing to register as a lobbyist for a foreign interest under the Foreign Agents Registration Act. Fusion said in a July statement that “it complied with the law” and “worked for and under the supervision of an American law firm to provide support for civil litigation in New York” and thus was not required to register under FARA. In other words, the work product was for the litigation, not any lobbying. As far as we can determine, there is little evidence Fusion itself was involved in the anti-Magnitsky advocacy, even if the fruits of its research may have aided foes of the Magnitsky law. Browder suggests the timing of Fusion’s activities is questionable. He said Fusion contacted reporters between April and June 2016, when lobbying activity against the expansion of the Magnitsky law was in full swing. The court case, however, was still pending. FARA is weakly enforced, but two former Trump aides, Manafort and former national security adviser Michael Flynn, are under investigation for allegedly failing to comply with FARA. So one can see the White House’s interest in raising allegations of FARA fraud. Whether Fusion should have registered for FARA is now the subject of a Senate Judiciary Committee investigation. While there is an exemption in FARA for certain legal work, that exemption does not apply to public relations work. In the end, a federal appeals court in late 2016 ordered Baker Hotstetler to end its representation because of a conflict of interest (a lawyer at the firm had previously represented Hermitage). That apparently also ended Fusion’s involvement. Prevezon settled the case in May for $6 million, with no admission of wrongdoing, in what both sides claimed was a victory. (The United States had sought to seize assets worth as much as $24 million.) The competing claims were never litigated, though NBC News in July explored in detail the doubts about the Magnitsky case raised by Prevezon’s defense team. As we noted, Fusion’s original client for the Trump opposition research was said to have been a Republican. Fusion’s client list is not public, but critical news reports have cited Fusion’s work on behalf of Planned Parenthood in 2015 and against a Mitt Romney donor in 2012. We could find no record of political contributions by Simpson, though one of his partners, Peter R. Fristch, made two $500 contributions to Hillary Clinton campaign committees in 2016, according to Federal Election Commission records. But that does not necessarily mean the firm works only on behalf of Democrats or is “Democrat-linked.” Obviously, it would be helpful to learn who bankrolled the opposition research on Trump’s business dealings. Among its many clients, Fusion had two with starkly different goals. One client wanted dirt on Donald Trump’s business deals, especially in Russia, which would be potentially damaging to Russia’s interests because U.S. intelligence agencies concluded Russia wanted to give Trump an edge in the election. Another client wanted help in defending a lawsuit — and Fusion’s research ended up aligning with Russia’s efforts to reverse U.S. sanctions. It may not look very pretty, but this is Washington. Hired guns work for whoever pays the bills. In any case, Sanders’s spin falls flat. There were Russian entities involved, but there is currently no evidence that the Russian government paid for Fusion’s work on the Prevezon defense at the same time Fusion investigated Trump’s business dealings in Russia. We will update this account if more information emerges during the Senate investigation of Fusion, but for now she earns Three Pinocchios. 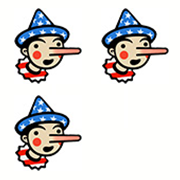 Update: On Aug 10, President Trump uttered this claim: “Additionally, it seems that Russia spent a lot of money on that false report, and that was Russian money, and I think it was Democrat money, too. You could say that was collusion.” That would be worthy of Four Pinocchios.